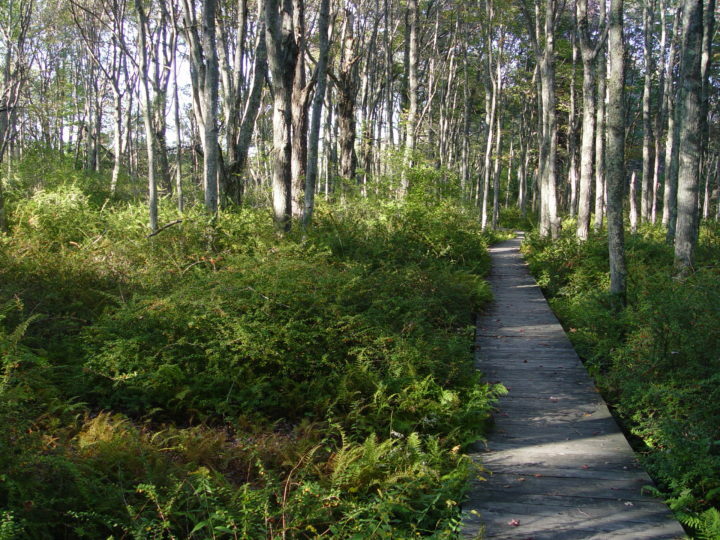 There are a lot of reasons to want to control the non-native plants that have invaded the state of Maine. But recent scientific research done on Japanese barberry adds one more big one to the list: the dense, thorny shrub actually creates a microclimate that is good for ticks. And that is bad news for people. Japanese barberry was introduced to North America in the 19th century by landowners who wanted to use it for hedgerows and other plantings, according to the New England Wildflower Society. But barberry didn’t stay where it was planted. 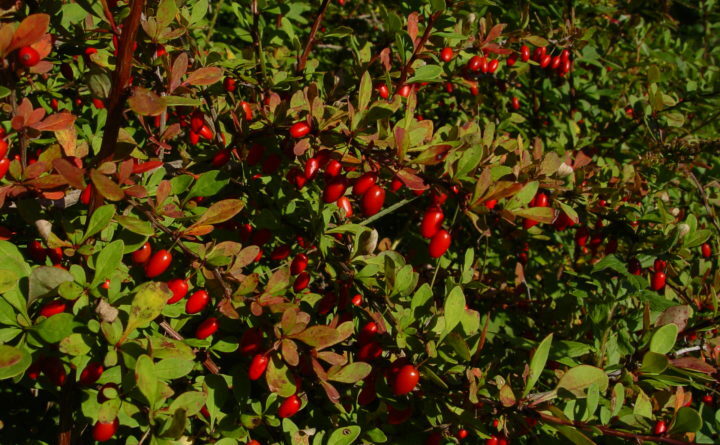 Its bright red berries are attractive to birds, especially wild turkey and grouse, and those hungry birds helped to spread the shrub around the landscape. Perhaps because of the very sharp thorns, deer don’t browse on the plant and check its growth that way. Long after a homestead has been abandoned, Japanese barberry persists, according to the wildflower society’s website. It is established as far north as Nova Scotia, as far south as South Carolina and as far west as Montana, according to the University of Maine Cooperative Extension. Today, the invasive species is found in all six New England states and has been prohibited in Maine, Massachusetts and New Hampshire. And it can change the forest, Elias said. Very little other than ticks, and the mice and other species that host the ticks, that is. She and other researchers from the Lyme and Vector-Borne Disease Laboratory started to look into barberry about a decade ago, after they got a grant from the United States Centers for Disease Control to study the habitats associated with deer ticks. At that time, it was basically known that deer ticks were associated with hardwood or mixed forests, not coniferous forests. Japanese barberry, an invasive species, at a preserve in Wells. During that work, Chuck Lubelczyk, a field biologist at the lab, began to notice an association between ticks and Japanese barberry. What he and other scientists learned is that within the barberry thickets, the humidity is higher and the temperatures are lower than outside the thickets, and that is helpful for ticks. So, what to do? Unlike most of the conventional wisdom about ticks and Lyme disease, which generally encourages people to do their best to avoid getting bitten, there is a chance to do something proactive about Japanese barberry. A long-term study released last fall from researchers at the Connecticut Agricultural Experiment Station found that clearing the shrub from the woods can lead to a significant reduction in tick abundance and also reduce the risk of Lyme disease. Scott Williams, who headed up the research team, recommended that people return to clear the barberry every five years, because the nine-year study showed an eventual rebound in barberry and tick abundance. “My legs are permanently scarred from the barberry thorns, and I have had Lyme disease three times as a result of the research, but it has been worth it to educate the public how a non-native invasive shrub can alter native ecosystems and can have indirect effects on public health,” Williams told the journal Entomology Today in an article published last October. According to the Mayo Clinic, it is possible to get Lyme disease more than once. Yet eradicating barberry is no simple task. According to the University of Maine Cooperative Extension, mechanical removal of the thorny shrub is recommended because it is effective. Japanese barberry is one of the first plants to leaf out in spring and can be distinguished from other shrubs. Whole shrubs can be removed with a hoe or a weed wrench, a tool that allows the user to lever plants out of the ground. But be careful, and wear thick, sturdy gloves to protect hands from the spines, experts said. Japanese barberry can resprout from roots, so it’s important to remove as much of the root as possible. Also, a flame-weeder (propane torch) can be effective if used in spring and followed-up during the summer to treat survivors, according to the Maine Department of Agriculture, Conservation and Forestry’s Maine Natural Areas Program.